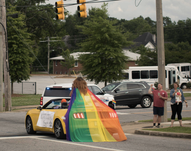 Love and Pride in Alabama: A Photo AlbumDeep in the Bible Belt, L.G.B.T. communities are fighting for greater visibility and acceptance. ​June 29, 2018 - In dense urban centers, the image of Pride as a week of bacchanalian parties and corporate-sponsored floats has caused some to question its importance. ​June 27, 2018 - As part of the firm's celebration of Pride Month, Bass, Berry & Sims hosted Josh Burford, an award-winning historian, archivist and educator with over 20 years of experience building stronger LGBTQ communities across the US. June 22, 2018​ - ​On Sunday, tens of thousands of people, L.G.B.T. and straight and trans and cisgender, will pour into the streets of Manhattan for New York’s annual Pride March. This year’s celebrations, however, will be colored by national politics. For the second year in a row, the president won’t even acknowledge Pride Month, but will make proclamations about Homeownership Month. This is all happening as overall acceptance of L.G.B.T. people has dropped for the first time since 2014. Charlotte Pride presents the annual lesbian, gay, bisexual, transgender, questioning and queer (LGBTQ) Pride festival and other events in the Queen City. Our mission is to promote LGBTQIA pride primarily for, but not limited to, members of the Black community while building social awareness. Time Out Youth is a youth center for lesbian, gay, bisexual, transgender, and questioning (LGBTQ) youth and their allies, ages 11-20, in Charlotte and the surrounding areas. Trans Support group PFLAG, founded in 1972 with the simple act of a mother publicly supporting her gay son, PFLAG is the nation's largest family and ally organization. The Freedom Center for Social Justice, founded in 2009 and as a Southern-based national organization, we see all too often how the poor, people of color, immigrant communities and sexual minorities are excluded and marginalized.